There comes the day a printer stops extruding and after a brief research I notice the extruder motor is not spining. - X, Y, Z axis move flawless. - Taking measurements on all the DRV potentiometers (green on the below image, X, Y, Z, E0, E1, E2 from right to left) and all of them get the same voltage. - Wires are fine, all of them tested and motor was tested on X fine so wires are ok. So I need to know how to diagnose further, the drivers or whatever is causing this weird behaviour! This is specially weird that only Ex are not working, specially E3, which I never used before! !?? So how do I proceed with troubleshooting this?!? One further test... if you plug the X motor into the E0 connector, does it move? However, I think this may actually be caused by software interlock? If the hot-end temperature is too low or too high, Marlin, Repetier, and I guess other firmware will refuse to extrude. Look at the log/terminal window and see what the firmware is telling you. No, i disabled "Cold extrusion prevention" in Marlin, so Im covered there. And no, X motor won't spin either in the Ex connectors. OK. There's no hardware reason why the extruder motors won't turn. So I still think it's a software problem. Marlin is working since the other motors work, so I think Marlin is intentionally stopping you from extruding. Look at the log/terminal window -- it should be telling you why.Maybe the thermistor is shorted so it's seeing a MAXTEMP rather than a low temperature? I don't know if this applies to Marlin, but Repetier checks that the temperature is increasing when the heater is on, and shuts down if not. Once an error is detected, you need to send an M999 to re-enable things. Yeah Im using Octoprint to monitor and enable motors and terminal window shows no heating issues as I disabled them on Marlin straight. When in a printer I get a MAXTEMP or any other M999 error, as you say I need to restart the service and even reset the printer to get it back on. This is NOT the case. Extruder is simply ignoring me. And the weirdest part is "just" the THREE Extruder drivers, even one that I've never used, don't work. Wasnt there a setting to FIRST ERASE the whole contents of AT2560 before reflashing? For my own sanity's sake!!! I use "erase Eeprom" sample program in the Eprom folder of ArduinoIDE. ANyone else can provide hints? Did you check the Rumba board for cold solder joints or broken traces? Well the board is not new, Id be surprised if at this point any broken traces (without moving the board) or cold points do appear (there are several fans near it). Is that even possible? Extruder was working fine to date. Its most likely either a dead mega chip or dead stepper drivers... which, does it mater?, you can't fix either. run the test, if e0, e1 and e2 aren't all moving.. its dead. Get yourself a new board, put it aside to practice hot air rework on. Thanks, Dust. How is that test script supposed to be executed? NB This will wipe your current firmware, make sure you know enough to put it back. 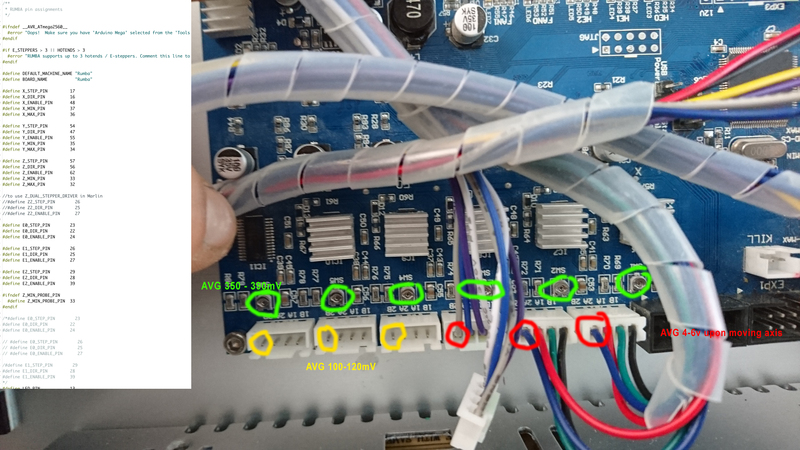 I have doubt about a hardware problem because I have two rumba (one was not used) and there is this problem on both board ! Did either of you run the test firmware? No I didnt, I refuse to believe a dirver I've never used is burned out for no reason....well, 3 in total. And the rest of the board works and communicates fine with the computer. Good luck to you then. Edited 1 time(s). Last edit at 12/29/2017 08:58PM by Dust.